Yet Irving Berlin did not know how to write a note of music. He played his songs and melodies on his “Buick,” a piano which allowed automatic key changes, and dictated his songs to his musical secretary, Helmy Kresa. These and other fascinating details can be found in Rosen’s book, alongside a continually unwinding theory about the importance and impact of this song, –the greatest musical hit of a popular song in American history. It remained the most recorded song worldwide for over 50 years. Rosen, a journalist, provides a readable outline of the life and times of Irving Berlin, along with commentary on America, told in “images” of “the way things were” to provide context for the reader. These are provided in order to demonstrate the huge impact of this song during its initial release, and in the 60+ years subsequent. The surprises are many. 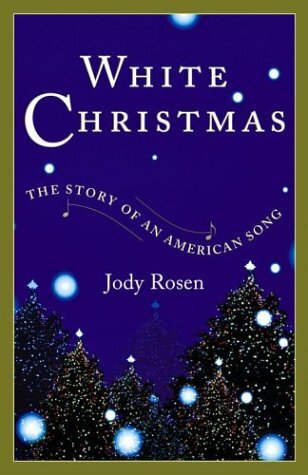 Rosen outlines how “White Christmas” started out as saunter poking fun, and ended up as the epitome of a sentimental “home song.” A number of things paved the way for the massive and instant success of the song when released: the in’s and out’s of Berlin’s planned and executed uses of the song in the movie Holiday Inn; the change to eliminate the opening verse on all sheet music after the release of the Bing Crosby recordings; and the claim of wartime adoption of the song by troops abroad in World War II longing for home and peace. Rosen points out the ironies of a Jewish man writing a secular song about Christmas, using mass media (film, radio and recordings), to laud dreams and nostalgia of a Christian idyll of America in the nineteenth century. Rosen demonstrates how the song certainly aided the process of ‘secularization’ of Christmas. Starting after World War II, the smash success of “White Christmas” kick started a trend. Christmas popular songs dominated the airwaves during the season, (and those in the 1930s, 40s and 50s also having been mostly written by Jews). Huge mass marketing focused America’s artistic creative talents and energies (and lesser talents) on the holiday. The result was an imposing and pervasive atmosphere of Christmas, which eventually turned out to be one of the most pressing social problems for many Jews in America. Year after year, the bombardment began, and year after year Jews were faced with the ‘Christmas dilemma.’ In an ironic twist, Jewish success in the arts and business of Christmas, such as Berlin’s, helped create a catalyst to Jewish demise from the pressures of the lure of Christmas. Yet Rosen also points out that the American-style secularization of Christmas, took away the edge of society focusing on the European-based traditional hatred of Jews that came with every Christian holiday. American Christmas tried to be inclusive “for everyone.” The “good will toward men” included not only Jews, but also today Muslims, Buddhists, Hindus and everyone else. Irving Berlin meticulously guarded the copyright of his songs. “White Christmas” and “God Bless America” were his two favorites. He controlled them completely. From the beginning of the release of “White Christmas” (where he would only accept Bing Crosby as the singer), he reaped untold fortunes from it until the copyright expired just before his death at 101. At the end, Berlin lived long enough to see his songs fall from the popular consciousness and the style of music of Tin Pan Alley fade into history. By mid-century, Rock and Roll defined a sea change of style that has led to the present. Sentimental ballads were out of favor. But “White Christmas” became imbedded in the American psyche as defining the American sentiment about its holiday celebration. This is a fascinating book. Not only does it provide a capsule account of Berlin’s life that is easy to read, but it brings in the element of the Jewish impact on American culture and vice versa. One genius made a difference. There is no doubt after reading this book, that Jews, –their needs to be accepted and acculturated into American society, and their absolute adoring love of this country– have completely intertwined Jewish musical history with America. Forever.